With more than 40 years of legal experience to his credit, Mr. Knight is an expert in the field of civil defense litigation. His dedication to building strong client relationships while maintaining a high standard of legal ethics and integrity have resulted in a professional track record and reputation which speaks for itself. Defended a major automobile manufacturer which was sued for fraud and breach of contract by a sign manufacturer. After four weeks of trial in federal court, the trial court granted the defendant’s motion for judgment as a matter of law on all claims. Defended a Korean seatbelt manufacturer against claims of wrongful death related to their product. After a two week trial, the jury returned a verdict in favor of the plaintiff which was set aside by the trial court. Represented the plaintiff in a commercial fraud case against a private investment firm, with the jury returning a verdict in favor of the plaintiff after a two-week trial. 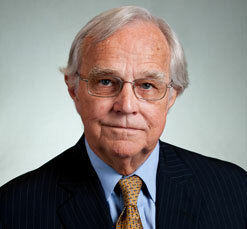 Mr. Knight believes in the necessity of treating all parties to a legal proceeding with honesty and respect. He served his country in the United States Army from 1965 to 1967, achieving the rank of Captain prior to his honorable discharge. Mr. Knight has been married for 44 years and has two children and five grandchildren.